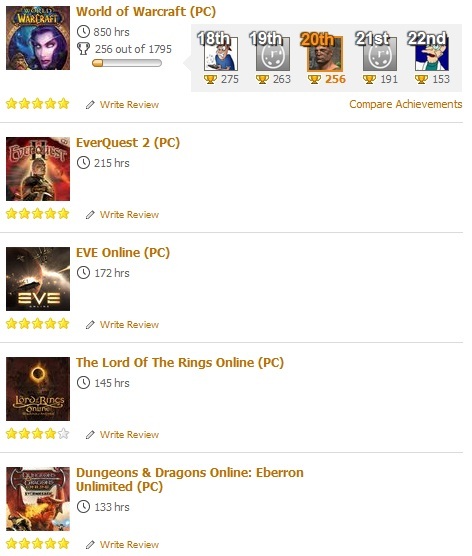 This entry was posted in Commentary and tagged EVE Online, EverQuest II, Raptr, team fortress 2, World of Warcraft, Xfire. Bookmark the permalink. I still have Raptr on this computer, and I have it track gameplay sometimes, but it’s probably so woefully inaccurate that it’d never really be indicative of how long or how much I play a video game. The only thing I realized I didn’t like was broadcasting to the world my gaming habits… it made me self-conscious. Looking at that makes me sad. Plus, I stopped WoW recording years ago when it hit 1337, and it only recorded many games for a short period of time. I know I have at least double time in Vanguard, Lineage 2, and a couple others. Over 8000 total hours over the years, and that’s about 3k+ hours off. In my defense, this all started back around 05 or 06. Its weird to see all that time added up though.